Greece is coming kicking and screaming to the reform table. The Syriza government’s latest proposals include some concessions to its public creditors. The plan still lacks detail, and reneges on past promises. The risk of an accidental euro zone exit is rising. As agreed in February, the left-wing Syriza government needed to flesh out its own reform agenda to unlock funding from its international public creditors. Some 1.8 billion euros of debt matures next week, including 430 million euros owed to the International Monetary Fund. Yet the most important number in the latest document, submitted on April 1 and published by the Financial Times, is 23.4 percent – the government’s new unemployment rate estimate for 2015. That’s almost 1 percentage point more than the previous forecast. Barclays meanwhile expects unemployment to reach 24.5 percent of the labour force. This turn for the worse is the cost of Prime Minister Alexis Tsipras’ push to renegotiate the bailout with euro zone creditors. The latest plan from Athens represents some progress. There is an effort to flesh out a previously-vague plan to reform taxation and fight evasion from which the government expects to magic 3.1 billion euros. Commitment to privatisation looks a little more serious now, with proceeds of 1.5 billion euros to be raised this year. There is still a wide gap between Greece and its euro zone partners. Tsipras appears to intend to row back on labour reform, push up the minimum wage and flouts lenders’ desire to lower pension spending. These together cost 926 million euros this year. The euro zone is treating Greece with the tough love of an exasperated parent. It is refusing funding, but credit is still flowing thanks to European Central Bank benevolence. Greece can survive in the short-term by not paying domestic bills. It could even find a way to skip payment on its International Monetary Fund loan. The point of no return will be a 3.5 billion euro bond owed to the ECB in July. A default would force the ECB to cut off funding, banks would fail and capital controls become unavoidable. Greece could then chaotically leave the monetary union while Tsipras blames it all on the ECB. Alternatively, as the pressure mounts, he could also jettison the most leftist fringe of his party, cobble together a new coalition and reach terms with Europe. The faltering economy – Barclays forecasts a 0.5 percent slump this year – may ultimately break Syriza. Yet it will also make the road to recovery even longer, and Greeks more desperate. 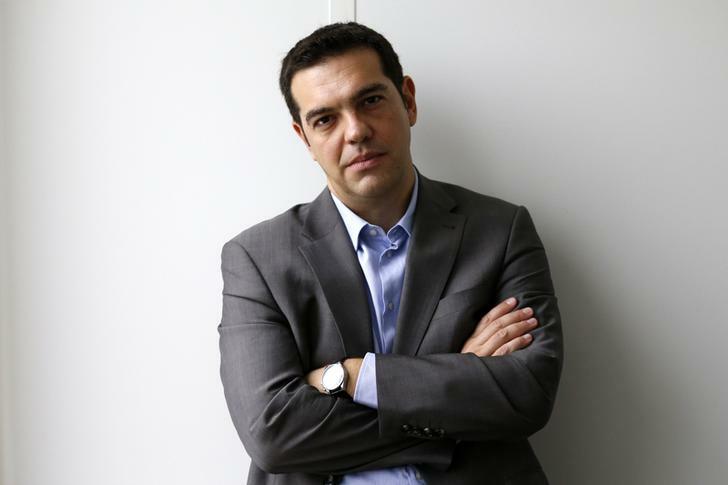 Head of Greece's radical leftist SYRIZA party Alexis Tsipras poses after an interview with Reuters in Paris. Greece sent an updated list of reforms to lenders on April 1 to try to unlock financial aid and avoid a default, but euro zone officials said more work was needed before new funds could be released. Greece is weeks away from running out of cash, but its euro zone and International Monetary Fund lenders have frozen support payments until it implements reforms, with talks bogged down over what measures the leftist-led government must take. “We sent a new document today to the Brussels Group (of EU/IMF lenders) which is more specific and quantified,” a Greek finance ministry official told reporters, noting that labour and pension reform were the main sticking points in negotiations.